My approach to the A-Z challenge this year, is to use the same method that I have used the other two times I participated. I do not do any pre-planning or pre-writing of posts. I suppose that it would be less stressful if I did have the whole thing mapped out weeks ahead of time. Those who have a theme are most likely having an easier time. I went back today to re-read it and I would rate it as a fair first attempt. That month I wrote seven more times. By the end of the year I had written 132 posts. In 2012 I wrote over 200 posts. Last year, however, I slowed down considerably. The experience of writing is personally such a positive one for me. After I have completed a piece, I promise myself that I will write more often. 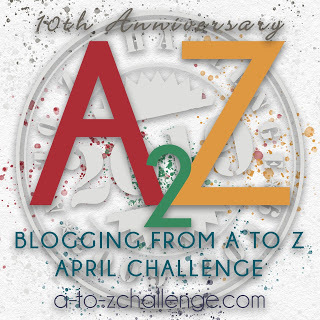 The A-Z challenge is an impetus for me. A self imposed, group motivational way of encouraging me to flex my writing muscle every day. Writing almost has the same effect on me that a brisk walk does. My adrenaline levels rise and I feel energized. After I have finished the piece, I’m sure my brain releases a good dose of endorphins because I feel calm and satisfied. That is why I do not have 26 posts written ahead of time. “They” say that if you do something everyday for 21 days, it will become a habit. So, A-Z is the perfect way to start. Right? Today, I did what I do when I am having a difficult time thinking of a topic. I used Google, and typed “words that begin with the letter F” into the search box. As I was looking through the images that the search provided, this quote caught my eye and then my attention. It’s funny because I was going to write about Fear. That was going to be my “F” word. I was intrigued enough by that quote, that I had to find out where it came from. 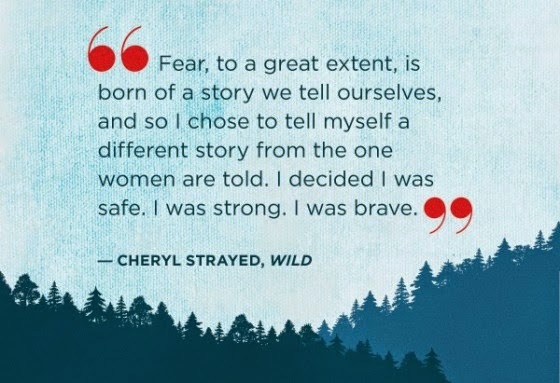 The quote is from the author Cheryl Strayed. She wrote the book Wild. 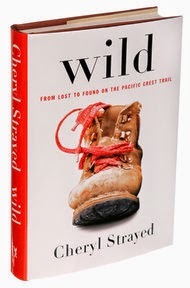 “Wild recounts the months Ms. Strayed spent, during the summer of 1995, when she was 26, hiking alone on the Pacific Crest Trail from the Mojave Desert through California and Oregon to Washington State." The quote about Fear and the review of Wild by Mr. Garner have sufficiently piqued my interest to make me want to read the book. This is another positive benefit of participating in the A-Z challenge. I often have to do research which usually leads me down paths I may never have discovered. Being wary of the unfamiliar, by the way, happens to be one of my biggest fears. So while I may not be brave enough to solo hike the desert, I can certainly fantasize about it while I am reading Wild. I didn't plan either. I trust the universe will provide inspiration. On Saturday the universe provided a funeral! Oh no, I will have to head on over to your place and find out what happened. Hi! I didn't make a plan for my A-Z posts either. This is my first time participating. I, too have used the approach of looking up "words that begin with…." We are going on vacation next week and so I have been a little worried about getting my posts done then (and not just vacation really, since I've never posted daily). I have done a few posts ahead of time, only when something blog-worthy (in my mind anyway) pops into my head. I have sat down right at that moment and written the post. Also, like you, this challenge prompted me to go back and look at my first post! I am enjoying you blog. Funny, we have to go away in a few days also. Our destination is a 6-7 hour car trip. I’m going to bring my laptop and try to squeeze in a post or two in between events. In the two years previous I wrote every day pretty much on the fly. But this year it took some planning because I'm writing and matching that writing to a photo or two. btw I love that quote, let us know how the book is when you're done! Yes, the book is on my list of reads. I’ll let you know what I think. Hello again. This A to Z is a big challenge for me too. I fear I may not be able to come up with enough topics to finish it. Like you I have not preplanned this adventure. Maybe I should give it more thought. Keep up the good work. Thanks. I feel that way too, that I might not be creative enough to finish. But I did it the last two times, I am hopeful I can manage again. I feel the same way you do about the benefits of writing--and I did far too little of it the past year. Leading up to this year's A-Z, I have been journaling every day in an almost compulsive way, writing so much I filled a notebook in three weeks, which I haven't ever done--not even in my teen years when I wrote myself into writer's cramp on a regular basis. And I read Wild--I absolutely loved it--reviewed it on my blog. Will be curious to hear what you think. I love the entries you publish from your teenage years. I think that is so cool. I am not a journaler. It’s something I wish I had the discipline to do, though. I try to encourage my grand daughter to do it.